This week’s post is by Amy Madden (MBA, CTS, LEED®AP). Amy is the Sales Support and Projector/FlatScreen Lifts Product Manager at Draper, Inc.
One of the strong points of Draper’s line of projector lifts is the depth and breadth of the line. There are so many options it can sometimes, frankly, become confusing when you’re trying to figure out the best solution for getting the projector into the room. 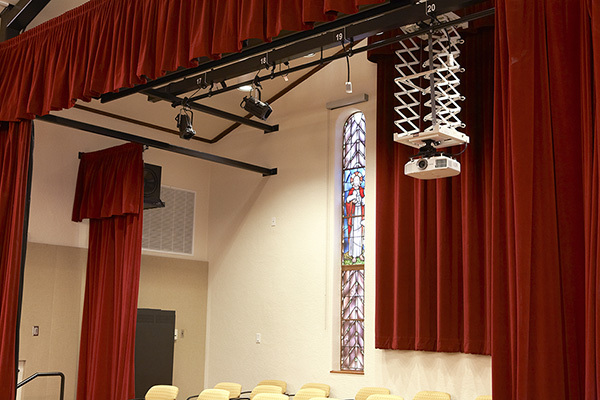 Enter Draper’s online Projector Lift Selection Tool. Draper’s UL-listed Scissor Lift is part of the industry’s most comprehensive line of projector lifts and a possible choice in the Projector Lift Selection Tool. The projector lift selector makes it much easier to decide which projector lift to use in a given application. The tool starts by asking about the desired show position of the projector-from directly below the ceiling line to 28’ down into the room. It then asks for the projector weight and dimensions and magically outputs the options you have available to you. I say magically because I am amazed at our marketing department’s capabilities at building such tools. I have no idea how the back end functions, and honestly I don’t need to…as long as it works! I hope you find this tool easy to use and helpful in determining which lift “fits” in your project. Draper also offers a set of online screen selection tools, allowing you to match a screen surface and product model for your project based on specific parameters custom to your design. These tools-and much more-are available in Draper’s Pro Portal. If you haven’t yet registered, you should. It’s free, and it’s easy. Just following this link and get started today: www.draperinc.com/DraperPro.